Clay Tempered Katana Swords for sale measure 42 inches in all. 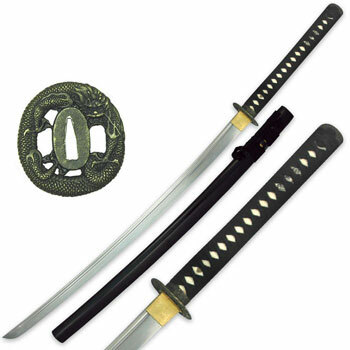 They feature a sharp 1045 carbon steel functional katana style blade with a blood groove. They are hand sharpened and hand forged through an ancient clay tempering process. The handle features a traditional Japanese cord wrap and genuine ray skin. These full tang samurai swords feature a solid brass habaki and accents. The tsuba and pommel are made of cast zinc alloy. The tsuba features a highly detailed dragon design. They also include a black hand-lacquered scabbard that has been custom fit to each of these katanas. Buy the handmade Clay Tempered Katana Swords for $99.99.